3. Keep rotating with wrist then the ball will spin faster, develop a higher pitch sound. Once you feel it spinning fast enough, stop your rotate, you could feel it oscillating right in your palm. AUTO START: Auto start powerball with incredible high speed, up to 20,000 rotational speed per minute pass through testing, blue LED lights come out when you doing exercise. Human control the speed and power, 10,000 rotational speed per minute about 48.50lb power, correspond to 50 dumbbells of different weights. GOOD FOR HEALTH: Efficiently rehabilitates wrist pain, humerus fracture, scaphoid fracture, radial head fracture, numbness in fingers, numb hands, fractured wrist, elbow tendonitis, broken bones, olecranon bursitis. Increases strength in fingers, wrists, hands, forearms, biceps, triceps, ligament and shoulders. MAKE ERCISE & ADD FUN: Novelty design with LED lights, which is fun to see how fast you can get it spinning. Cool LED lights inside will light up while spinning, no battery needed,powered by rotating the wrist. Rehabilitates sore muscles, Kill the time & Add fun ! QUALITY: The unit did not have any weird vibration to it. Also having the silicone grip section is very nice as it helps with the gyro ball not coming loose from your hand. 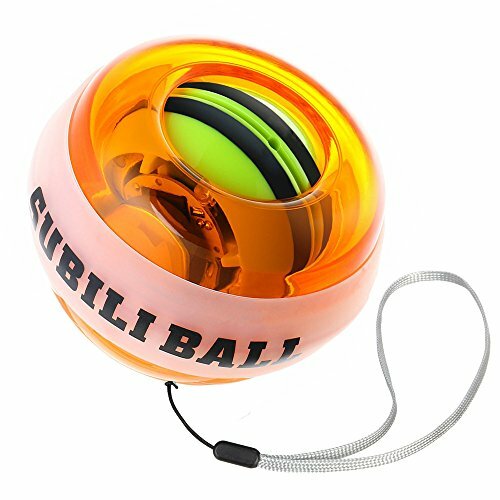 There is a place to attach a lanyard of sorts, think wrist strap, if you are really concerned about the gyro ball flying away. NO BATTERIES: Impact Resistant structure with Military-grade plastic shell. The more exciting part is, this exercise ball lights up when it's spinning! And the LED light is not powered by batteries. It's battery free. No need to worry about power running out. It will keep lighting up as long as it's spinning! If you have any questions about this product by kecho, contact us by completing and submitting the form below. If you are looking for a specif part number, please include it with your message.